A study by the developers of the Praxis tests found that the number of teachers who themselves had a GPA of 3.5 or higher increased from 27 percent during 1994 to 1997 up to 40 percent between 2002 and 2005. On top of that, would-be teachers’ verbal SAT scores rose 13 points, and their math scores jumped 17 points over the same time period. 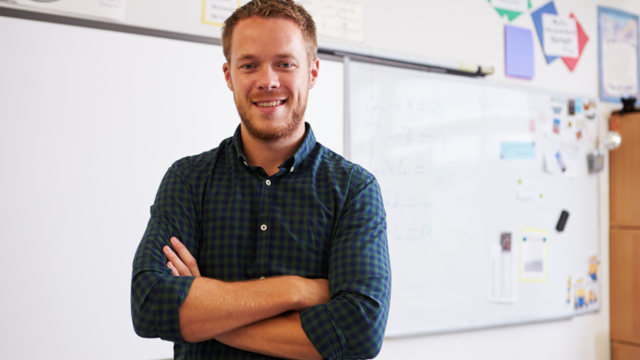 One of the best ways to help yourself excel in this increasingly competitive market—and something that will be of utmost benefit to your future students—is to become an effective, enthusiastic and hardworking teacher. As obvious and overly broad a goal as that may seem at first, there is a straightforward, actionable route to getting there: Figure out early in your graduate school or teaching training program who (age level) and what (subject) you would like to teach. The sooner you answer these crucial questions for yourself, the sooner you’ll be able to start concertedly building on your strengths, focusing your training and setting yourself apart as a fantastic and passionate teacher early in your career. But what are the best ways to determine who and what you ought to be teaching? Below, we’ve listed a few of the best ways to get started. 1. Spend time in classrooms observing students—and yourself. Before you start a graduate school program, or early in your grad school career, find opportunities to observe classrooms of different grade levels. Note your comfort with their energy levels, and pay attention to where your frustration peaks and when you feel most excited and engaged during the learning experience. You can spend time as a regular in different types of classrooms by offering to volunteer as a tutor, mentor or teaching assistant. Do you feel your passions coursing when you’re helping the teacher intermix play and repetitive practice learning concepts such as reading and math? That could be a sign that an elementary teaching position is for you. Do you yearn for more opportunities to guide students as they unpack and explore complex topics? It’s likely that you’re best suited for a position in a high school. 2. Take stock of your passions. In deciding which age group(s) and subject(s) you’ll likely most enjoy, spend some focused time taking an inventory of your own natural interests and aptitudes. Do you most value the satisfaction of mastering a single subject or craft, or do you derive energy from a day full of variety? If the latter is true, your best chance of setting yourself up for days full of various subjects is by teaching elementary school. On the other hand, if you want to specialize and go deep into one subject area, you might consider the benefits of teaching a single subject at the middle school or high school level. Deciding which subject to teach should be easier following more time assessing where your passions and natural interests lie. 3. If you know where you’ll be living and teaching, do a job search for teaching positions and see if you notice a preponderance in a particular age group or subject. Of course, it’s always important to keep in mind which path will offer the most job security. That said, don’t base everything on this quandary. The most important thing is that you love what you’re doing—because that will help you to be as good a teacher as you can be. But a job search on Indeed, Teach.org or another database of educator opportunities can help you narrow down your options if you’re feeling indecisive. 4. Decide how drawn you are to the role of nurturer and what type of relationship you’d most like to have with your students. Elementary school students are adjusting to the new school environment and are still very reliant on the adults in their lives to help them cope with all manner of daily challenges. High school students, on the other hand, often need to be drawn out of their shells with a more careful, hands-off approach. Where would you do better? 5. Consider which of the inevitable behavioral challenges will prove less draining for you. Repeatedly requesting that your students put away their cell phones, or confronting constant tattling and off-task behavior? Pushing through feigned indifference, or cleaning up bathroom accidents? Dealing with the regular high school headaches is likely to tap more emotional intelligence and problem-solving along these lines, while tackling the typical elementary school challenges can often call for a higher threshold for chaos and noise—and an ability to intelligently navigate them to make the most of lessons and play time for students. It’s crucial that you don’t take the decision of where to focus lightly at the onset of your teaching career. Luckily, there are steps you can take to ensure you make the right decision long before you take your first teaching job. Giving these questions some deep thought represents a service both to yourself and to your future students.